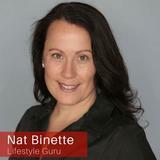 Nat Binette has mentored 260 of the world's most profitable Coaches & Consultants. She has personally achieved $21 Million in service sales. Now it’s your turn. Nat’s life’s work is focused on equipping coaches, consultants and experts to create revenue streams and master the art of selling so that you can live a life of global contribution. Not only has Nat generated $21million in sales, in her own service sales career, but she has also spent 20 years successfully creating content for public speaking events, workshops, retreats, online courses, webinars, 1:1 mentoring and group facilitation. As a veteran revenue enhancement specialist, life coach and public speaker, Nat has become a global authority working with large corporations and universities such as Deakin University, the Canadian Government’s New Entrepreneurs Program, Commonwealth Bank, Rogers Telecommunications, Wanted Technologies, Westpac Bank, and more. Nat knows exactly what it takes to create service offers and products your market adores, and set your business up for incredible success. JOIN NAT’S GROUP OF 23,000+ COACHES TO RECEIVE FREE DAILY TOOLS, TIPS AND TECHNIQUES TO GROW YOUR BUSINESS.